Observing the Infrastructure Code of Practice and the UK/Norway Framework Agreement; guidelines for Pipeline Works Authorisations. This page contains a number of sections concerned with various aspects relating to Upstream Oil and Gas Infrastructure, including negotiations for third party access, information about UK platforms and pipelines, and the arrangements for applying for Pipeline Works Authorisations. If a third party is unable to agree satisfactory terms of access with the owner of the upstream oil and gas infrastructure, the third party seeking such access can – and under the terms of the Infrastructure Code of Practice may be obliged to – make an application to the Secretary of State to require access to be granted and to determine the terms on which it is to be granted. The current guidance reflects the third party access provisions of the Energy Act 2011 which came into force on 21 March 2012. The OGA will review the guidance in the light of industry comments, experience and other information when necessary; the latest version dated 15 July 2013 incorporates revised text from the Office of Fair Trading regarding competition law. As a result of work carried out by the PILOT Infrastructure Access Group during 2012, it was agreed that more effort should be made across industry to review the effectiveness and outcome of each third party access negotiation. The prospective user and host owner groups should carry out a post activity review in order to learn lessons from the process and seek improvements that can be made for the future. Building on this, we now expect the user operator and host operator to each complete a questionnaire which gathers information on the approach taken in the negotiation. The questionnaire is divided into two phases; the first covers the handling of the enquiry from the prospective user up to the point that a decision is made whether or not to proceed with a specific export route, and the second covers subsequent detailed negotiations through to conclusion (whether successful or not). The attached diagram illustrates this process. It should be noted that a reference number can be obtained from the OGA at the start of each third party access enquiry to an owner (on request to Upstream.infrastructure@oga.gsi.gov.uk), and this will also alert us that a negotiation has started. Use of this reference number when subsequently completing the questionnaire will ensure that the views of the parties for each negotiation can be analysed effectively. The information gathered by this process will be used by the OGA to follow up on specific issues with parties, as well as allow the analysis and tracking of industry trends. The questionnaire is named SPRINT (System for Performance Review of Infrastructure Negotiation Tracking) for short, and is contained within the Excel spreadsheet below. Should there be difficulties in using the spreadsheet, it is possible to use either of the Word documents to complete the questionnaire and send it to by email or as a hard copy. A user guide is also available below. Since the Guidance Notes for Petroleum and Submarine Pipelines were published in 1992, there have been some legislative changes. The Pipeline Safety Regulations 1996 were introduced by the Health and Safety Executive; as part of a consolidation exercise, the Petroleum Act 1998 repealed and replaced the Petroleum and Submarine Pipelines Act 1975 and the Offshore Petroleum Production and Pipelines (Assessment of Environmental Effects) Regulations came into effect in 1999. All have had an impact in the process of making an application for an offshore Pipeline Works Authorisation (PWA). Please note that either a Pipeline Works Authorisation (PWA) or PWA Variation should be in place before any construction/modification works of a pipeline or pipeline system begins. It is recommended that, before submitting an application, the prospective owner should informally consult both Pipelines Administration in the OGA and the Health and Safety Executive at the earliest possible opportunity, to discuss the proposed scheme and the regulatory requirements involved. Where there are no objections, it takes approximately 4-6 months from receipt of a satisfactory application to issuing the authorisation. In the case of pipelines in respect of which an environmental statement is required under the Offshore Petroleum Production and Pipelines (Assessment of Environmental Effects) Regulations 1999, the procedure may take longer in order for all the environmental issues to be properly considered. Operators are therefore urged to submit their applications in good time (at least 4-6 months before construction begins), to meet their deadlines. To assist operators when submitting an application please see below table regarding end to end processing times for issuing consents upon receipt of a satisfactory application. Current applications may use the checklist which can be found on the final page of the appropriate application template. The checklist may be used until the end of August to draft applications, however from the end of August 2015 only applications using the templates below will be accepted by OGA. All applications require a 28 Day Consultation period. 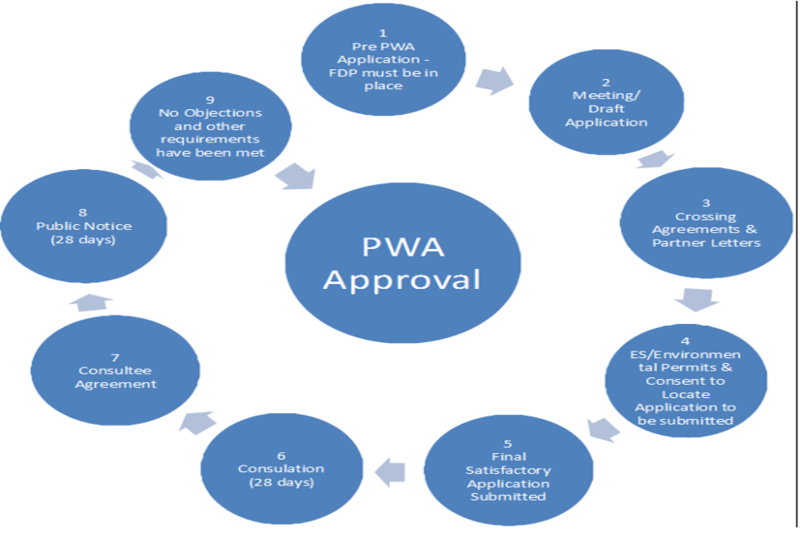 PWA application - for all new fields irrespective of pipeline lengths. PWA (with Median Line implications) - for all new fields irrespective of pipeline lengths within the UKCS. PWA Variation (Category 1- Long) - where varying an existing PWA and any new pipeline being installed in the Variation work scope is more than 500m in length and outside a HSE recognised safety zone. If unsure of which type of application or have any queries please contact the Consents & Authorisations Manager. at the design stage, companies should make contact with the Health and Safety Executive Specialised Installations Directorate in Aberdeen for Scottish waters, and the Hazardous Installations Directorate in Norwich for English/Welsh waters (see useful addresses (MS Word Document, 16.3KB) . as soon as the route of the pipeline and basic technical details are known, contact should be made with the Consents and Authorisations Section at the OGA in Aberdeen to arrange an informal meeting. it is important to ensure the application contains all required details (though minor changes may be made at a later stage) and does not contain unnecessary information – particularly in the form of pages of technical drawings. the application should be submitted in good time so the PWA may be issued before construction begins (approximately 4-6 months or longer if the pipeline crosses a median line and there are likely to be treaty issues or where there may be environmental concerns and the possibility of objections is higher). applicants should not hesitate to phone the case officer handling their application if they have any query regarding the content of the application or if they require clarification of the relevant legislation/procedure. the holder of the PWA must ensure the terms of the authorisation are upheld and that they make an application claire.grant@oga.gsi.gov.uk well in advance of any proposed modifications/variations and of any changes to the names/addresses of the holder/user(s)/operator and owner(s) for OGA’s consideration and possible consent. a draft application should be submitted to the OGA allowing checks and any additional information to be requested from the company prior to full submission and processing of the application. the applicant should discuss ‘consent to locate’ requirements with DECC’s Environmental Management Team (EMT) early in the process. EMT can be contacted at emt@decc.gsi.gov.uk or on 01224 254045. We are unable to issue a PWA consent unless the ‘consent to locate’ consent has also been approved. the application will be forwarded to consultees for comment (these are generally other DECC or OGA sections, other government departments, fishing federations and other users of the sea). All consults are asked to respond within 28 days. when any queries have been answered, and all consultees are content, the OGA will inform the applicant that they are to proceed to public notice. This requires the applicant to publish and make available for inspection details/maps of the project in such publications and at such addresses as may be directed by the Secretary of State for a period of 28 days. The applicant should forward the documents to the OGA for review and agreement, prior to publication. schedule 2 to the Petroleum Act 1998 sets out the procedure for considering any objections to the application. once objections have been resolved or if no comments have been received, the Pipeline Works Authorisation may be issued together with additional ‘consent to locate’ as referred to above. The PWA contains the terms under which the pipelines have been approved, which must be adhered to. The OGA will inform all consultees of the issue of the PWA and arrange publication of a notice to this effect. Under Part 3 of the Petroleum Act 1998 an authorisation is required for the construction and/or use of a “pipeline” in “controlled waters”. For these purposes, controlled waters means the territorial sea adjacent to the UK and the sea in any area designated under section 1(7) of the Continental Shelf Act 1964. The Energy Act 2008 defines pipelines as a “pipe or system of pipes (excluding a drain or sewer) for the conveyance of anything, together with all apparatus, works and services associated with the operation of such a pipe or system”. This includes pipelines used for the conveyance of hydrocarbons, water, chemicals, apparatus for the supply of energy for operations, hydraulic control lines or umbilicals, as well as services (for example the provision of fuel or power). Additional approvals and consents under The Offshore Petroleum Production and Pipe-lines (Assessment of Environmental Effects) Regulations 1999 (As amended), The Offshore Petroleum Activities (Conservation of Habitats) Regulations 2001 (As amended) and Part 4a of the Energy Act 2008 will also be required for their construction/use. the construction of pipelines in internal waters will require a Marine Licence and operators should seek advice from the consents team or EMT as requirements may differ between devolved authorities and dependent on whether the pipeline is associated with oil and gas, carbon capture and storage or gas unloading and storage activities. the MCAA (2009) provides an order-making power by which the Secretary of State may provide that the provisions of Part 3 of the Petroleum Act 1998 do not apply to a specific pipeline or pipelines of a specified description. in addition, the MCAA (2009) provides a second order-making power which allows the Secretary of State to provide that Part 3 of the Petroleum Act applies to specified pipelines or to pipelines of a specified description where the pipeline is used in connection with exploration for, or exploitation of, petroleum, or the importation of petroleum into the UK and that by virtue of the date when construction of the pipeline was begun, section 14(1)(b) of the Petroleum Act 1998 would not apply in relation its use. The person to whom the authorisation is issued. An authorisation may not be issued to a person other than a body corporate. The person(s) authorised by the PWA to use the pipeline for the purpose of conveying any fluid, or other, so authorised. The person designated by the holder as responsible for organising or supervising the construction or operation of the authorised pipeline in a manner that complies with the authorisation and, inter alia, with any relevant legislation existing at the material time. The works authorisation may name the operator as the holder. The person(s) in whom the pipeline is vested; and a person who has the right to use capacity in the pipeline, where such right has been acquired by that person on terms that – (a) he is entitled to use the capacity for a period of one year or more, and (b) the right is capable of being assigned or otherwise disposed of to another person. The Petroleum Act 1998 allows the Secretary of State to make an order, designating a person as the “owner” of a pipeline, after giving the person concerned an opportunity of being heard on the subject. Required before any material e.g. rocks/mattresses are placed on the seabed for the protection or support of a pipeline during construction or maintenance of a pipeline. A PWA must be in place before any Deposit Consent can be issued. Category 1 (Long) - Works are more than 500 meters or outside a HSE recognised safety zone. A Consent to Locate (CTL) should be applied for, partner agreements, crossing agreements, block crossings and the necessary environmental permits are to be in place and all approvals are to be received from the consults. Category 2 (Short) - Works are less than 500 meters or totally within a HSE recognised safety zone. In accordance with Term 16 of the PWA the Holder is to notify Claire Grant of proposed modifications/variations and of any changes to the names or addresses of the holder, user(s), operator and owner(s). The HUOO Template (MS Word Document, 154KB) is to be submitted upon execution of licence transfers or any other changes which occur. whether the deposit will be within or outside a 500m safety zone. Please note: this is for our information only and applications for temporary deposits should still be directed to the DECC Environmental Management Team for consideration. For pipelines that do not have a PWA, e.g. pipelines constructed prior to the coming into force of the Petroleum and Submarine Pipelines Act 1975, any deposition would require a licence under the Marine and Coastal Access Act 2009. However, by virtue of the Petroleum Act 1998 (Specified Pipelines) Order 2011, operators have the option of applying for a PWA for those existing pipelines that were consented before the Petroleum and Submarine Act 1975, therefore precluding the requirement for an MCAA license. It would be worth noting that there may be other circumstances where the operator may choose to apply for an MCAA License for specific activities in advance of seeking approval under the Petroleum Act (PWA) regime. MCAA licensable activities are likely to be primarily related to decommissioning operations, which are not activities exempt under the MCAA regime. Advice should be sought from the OGA consents team or DECC EMT. In order to allow urgent deposits to be made in emergency situations, an Open Permission has been issued for PWA Holders. In this context, an Open Permission is a type of approval that the Secretary of State issues once, to cover a whole class of regulated acts. This Open Permission constitutes the Secretary of State’s prior consent to all PWA Holders to make deposits where the deposit is necessary in order to (a) avoid or reduce the risk of the pipeline immediately rupturing or leaking or (b) to avoid or reduce an immediate risk to the continued use of the pipeline, subject to the further conditions and exclusions set out in the Open Permission. If a PWA Holder is satisfied that the Open Permission encompasses the deposit in question, and provided that the conditions and restrictions are fulfilled and complied with, the PWA Holder can make its deposit without further individual permission from the OGA. However, separate approval must be still be sought from DECC’s Environmental Management Team in the usual way. It is the responsibility of the PWA Holder proposing to use an Open Permission to be sure that it covers the deposit contemplated, and to ensure the satisfaction of the permission’s provisions. The OGA will not provide legal advice. If the Open Permission does not apply, the PWA Holder must apply for consent in the usual way, using the Deposit Consent Template. As a condition of use, the Open Permission requires that the PWA Holder completes the following template and submits it to the OGA by 9am on the next working day following the day of the emergency deposit. Please submit this to claire.grant@oga.gsi.gov.uk. Please note that for pipelines that do not have a PWA, this Open Permission would not apply. 30 December 2012 First published.